Gay Bradshaw examines how psychology uniquely intersects science, philosophy, and spirituality. Historically, the study of the mind has been a topic limited to understanding i>human /i> mindsÑwhat, why, and how we think and feel the ways we do. Now, with ÒdiscoveriesÓ from diverse fields, in particular recognition of Post-Traumatic Stress Disorder (PTSD) in elephants, horses, chimpanzees and others, the study of human and other animal minds are united in the single conceptual umbrella of i>trans-species psychology. 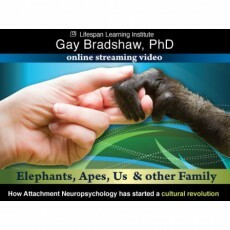 /i> Bradshaw explores how what we know about human minds and emotions can be applied to other animals and vice versa. This species common framework presages a radical paradigm shift culturally, ethically, legally, and scientifically. It also cast a new light on the nature of human identity. Drawing from case studies of elephants, chimpanzees, parrots, horses, and others. She discusses what concepts and methods from neuropsychology reveal about other species' as well as ourselves. This presentation provides intermediate and advanvced continuing education for clinicians, social workers, counselors, MFTs, LCSWs, psychotherapists and other mental health practitioners.